Equipment: sports shoes and sports clothes. Day 1: Leave Almaty at 19.00 by train to Tulkubas, arrival at 07.05. Drive to Aksu-Dzhabagly at 8 o'clock, breakfast, accommodation in guesthouse, breakfast, Explore the park on horseback. Horse riding - 30 km. Aksu-Dzhabagly Nature Reserve is the oldest nature reserve in Central Asia. It also is the first in the world to recieve UNESCO's status of biosphere preserve. For more than 70 years, the fauna and flora of Aksu-Dzabagly have been safe from logging, hunting and industrial pollution. The symbol of the preserve is the Graid's Tulip. There are other unique natural monuments as well. 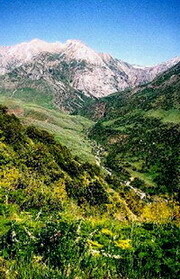 The Aksu Canyon is 15 km long and 500 m deep, with a width of 600-800 m.
There is also a paleonthological preserve at an altitude of 3000 m above the sea level. Petroglyphs here date back to the 5-7th cc. BC. Reserve is only 100km from Shymkent. During the visit, visitors will have the best chance to come into contact with wild nature, nomads and horses. Guests will be accompanied by experienced horse riding guides. This horse riding tour is possible for all healthy people, even for those who have not been riding before. Day 2: Return to Almaty by overnight train.